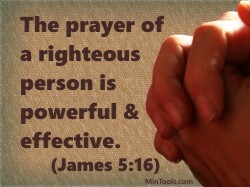 If “the prayer of a righteous person is powerful and effective” (James 5:16), then it’s important we pray at all times, in every situation, and with all trust in the Lord to hear and respond as we seek to pray according to His will. How can prayer not envelope the decision-making process? Wouldn’t it be foolish not to pray? 1) We need to pray for wisdom so that God’s will be done, not relying on our own understanding to make the right choices. Failing to turn to the Lord seems absurd when you remember that “his understanding has no limit” (Ps. 147:5). If “He founded the world by his wisdom” (Jer. 51:15), certainly He’s capable of guiding our steps. We’d be foolish not to seek after Him and His ways. 2) We should pray for decisions of any nature, not just for the big issues or when something’s wrong. The “little” things can be just as distracting. With His promise of peace and protection in place of anxiety and fear, certainly He’s able to see us through the good and the bad. We’d be foolish not to take everything to Him. 3) We ought to pray at all times and keep praying, not just sometimes when we feel like it or when it’s convenient. Does a single moment go by without our need for God’s intervention and sustenance? Certainly God’s wisdom, grace, and power are needed for every phase or stage of the decision-making process. We’d be foolish to think we can make it without Him. As Jesus said, apart from Him, we can do nothing (Jn. 15:5). We’ve noted how it’s foolish not to pray and to envelope the entire decision-making process with prayer. As church leaders, why settle for anything less than God’s best? Why needlessly worry and fret? Why spin our wheels striving to figure things out on our own when prayer is so powerful and effective? Hi Beloved Brother, Thanks a lot for your blessing messages.God bless you! In fact I am an Ivorian missionary in Ivory Coast in a town called DABOU. So I need your prayers and encouragement and messages on the mission field. It is my utmost request. God bless all the wonderful work you are building in His Name. Praise be the Lord Jesus! Yes indeed, praise be to the Lord Jesus! We certainly can take the time to pray for you and God’s work there in the Ivory Coast. I checked and you are signed up to receive the e-mail newsletter sent out once a month. If you subscribe to the Practicum on this site, you’ll receive notice every time a new post goes up. You can also sign up to receive e-mail notice when a new article is posted on the blog of the main site. We also have a website about Bible teachers training. If that would be helpful, you might want to subscribe to the TrainBibleTeacher blog as well. By doing so, you will regularly be receiving input. (Clicking on the links will take you to the pages where you can sign-up for each.